Despite its curious title, this moving and often humorous play concerns the difficulties of Beatrice, an embittered and tormented single parent struggling to bring up her two teenage children in 1970?s America. Tillie who has a fascination for science and Ruth, an epileptic, with a fascination for boys and gossip. Add in a white rabbit, a cloud chamber and a deaf nonagenarian, what’s not to love? Membership prices for the 2018/19 Season. (Concessions are for: ages 19 & under, ages 60 & over, student ID card, and members living more than 25 miles away). Each Member is entitled to 2 reduced-price members tickets for each of our 12 Main Stage productions, saving up to £8 per show (£7 for our Panto and £6 for CATS) – based on a member buying 2 tickets per production, PLUS an additional £1 discount off any of the programmes for these shows. Members can also get £1 off each of their tickets for our Studio Productions and reduced Bar prices during non-show weeks. Other savings are available to members during the season. Membership also shows your support for the theatre and can also open a whole new world for you – we are always looking for new talent, any age, to work in all areas of the theatre – no experience is necessary as you will be given full training by our qualified staff. 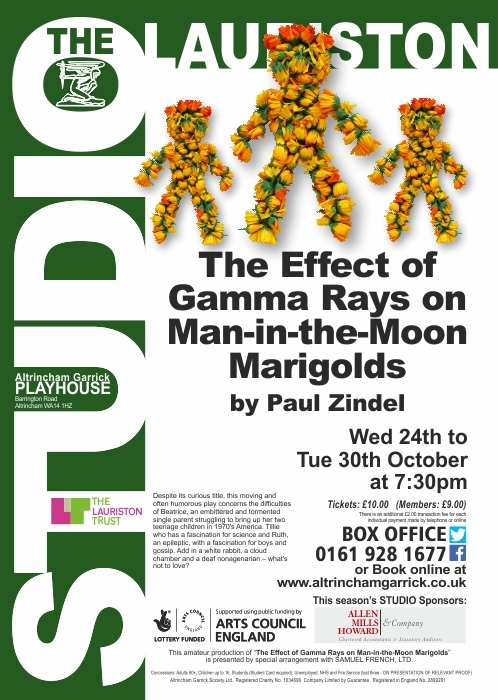 This amateur production of "The Effect of Gamma Rays on Man-in-the-Moon Marigolds" is presented by special arrangement with SAMUEL FRENCH LTD.